Time For Yesterday Time in the galaxy has stopped running its normal course. That can only mean one thing -- the Guardian of Forever is malfunctioning. To save the universe, Starfleet command reunites three of its most legendary figures -- Admiral James T. Kirk, Spock of Vulcan, and Dr. Leonard McCoy -- and sends them on a desperate mission to contact the Guardian, a journey that ultimately takes them 5,000 years into the past. They must find Spock's son Zar once again -- and bring him back to their time to telepathically communicate the Guardian. 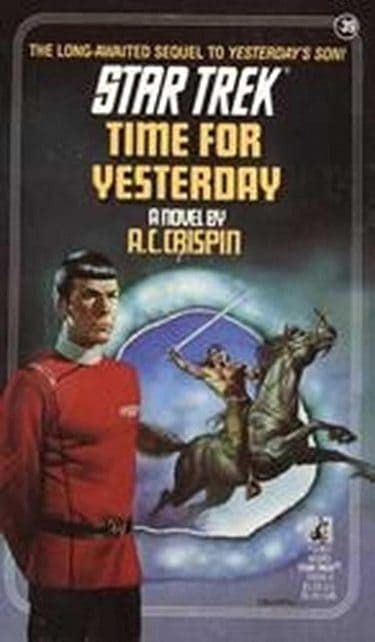 But Zar is enmeshed in troubles of his own, and soon Kirk, Spock and McCoy find themselves in a desperate struggle to save both their world -- and his! 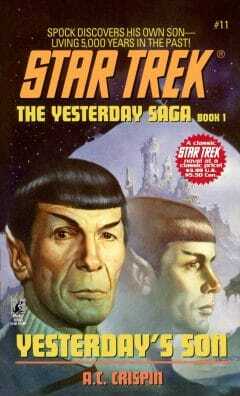 Other Books in Series "The Yesterday Saga"
The Romulans attack the planet Gateway, where Federation scientists are studying the Guardian of Forever - the mysterious portal to the past. The Enterprise must protect the Guardian ... or destroy it, but Spock has already used the portal to journey to the past. On the planet Sarpedion, 5,000 years ago, Spock knew a beautiful, primitive woman. Now he has gone back to meet his son!